Generation is about as constant as it gets. With one unit down, the U.S. Corps of Army Engineers is running the other three units at full tilt 24/7. My guess (for what's it worth) is that officials are trying to run as much water as possible through the system (through Bull Shoals) because soon it will all have to be held back due to the mass of water heading down the Mississippi. So they're running turbines and a little flood gates at Beaver Dam -- and Beaver is a little less than two feet above power pool. They are running three units full at Table Rock Dam, and that lake is a little less than a foot above power pool. Bull Shoals Dam is running four full units and the lake is a little less than one foot above power pool. We just had about a half-inch of rain yesterday, so all the lakes are holding at the moment, with no rise or fall. Lake Taneycomo's water is 43 degrees and clear which is about normal for this time of year. Our trout seem to be in great shape, fighting hard when hooked. We're seeing midge hatches early and late in the day which the trout key in on at times. We are not seeing any shad coming in from Table Rock through the dam. The best bite area has been drifting from Monkey Island through the bridges downtown Branson using red, orange or pink PowerWorms on the bottom. Depending on the wind, anglers are using 1/4-ounce weight to get the bait to the bottom. PowerBait is also working okay, as well as worms and minnows. There are some slower parts close to the bank where people are anchoring and straight-lining bait and doing well. If you try this area be sure to pick a slow spot AND have a knife ready to cut the anchor rope if you get in trouble. The "white bite" is a thing of the past I'm afraid, at least until the next time officials open the flood gates. We didn't get a long enough run of threadfin shad for those trout to stay on the white bite this time. They're back on darker colors -- brown, black, sculpin, sculpin/peach and sculpin/ginger. It's not that you won't catch a fish on white, but just not as many. Work the jig in slack water against the bank from the dam down and in the middle on the bottom. Use 1/8th- to 1/16th-ounce jigs, depending on line size and what you're working. Also, the wind becomes a factor. If it's breezy, switch to a heavier jig to control it, and/or two-pound line. Fly fishermen are drifting a scud, egg fly or San Juan Worm on the bottom in the trophy area and doing pretty well, too. 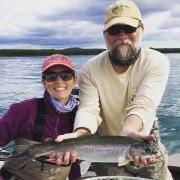 A great group from Oklahoma are fishing this week and catching nice rainbows on those flies. Their best area has been the Narrows, about 1/2-mile above Fall Creek. Make sure you're on the bottom there, or you won't garner bites. Were back to 3 full units. I wonder when they’re going to finish the work on the head gates. Hey Phil I meant that the resort owners,and recreation people will complain that their resevoirs might not fill back up in time for the boating and tourist season.The corps should absolutely draw down the lakes to protect all of the people against flooding during spring rains.You poor guys on Taney have had more than your share of short sided management practices by the corp.All of the big lakes were built to control floods but it seems that they are managed as recreational enterprises as of this date.I am sure there will be a lot of discussion on this subject.Everyone talks about 100 and 500 year floods but we have brought these on ourselves with climate change and over development everywhere.Rainwater has got to go somewhere and concrete and asphalt doesn't soak up much water.The Mississippi might not be high but the Missouri is at flood stage and we know where the flows into.